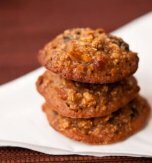 These oatmeal biscuits are very tasty while contain porridge, raisins, nuts, and sesame seeds. How can you resist temptation? The healthy oatmeal cookies are useful since they include ingredients with lots of vitamins and minerals. In addition it is easy to bake the dessert because everything you need to do is to mix all the components and shape the cookies. Place porridge oat and flour in a big bowl. Add the whipped whites of the egg. Mix everything properly. Next add pepitas or sunflower seeds, sesame seeds, raisins, chopped nut and sugar. Stir the ingredients carefully. Pour vegetable oil above gradually, stirring the mass continuously. The mass should get a thick consistency. Preheat oven to 190°C (374°F). Cover a baking sheet with parchment paper. Shape the cookies by the help of a spoon. Bake the dessert for 18 minutes or till golden and puffed. Cool the cookies and serve with milk or juice. 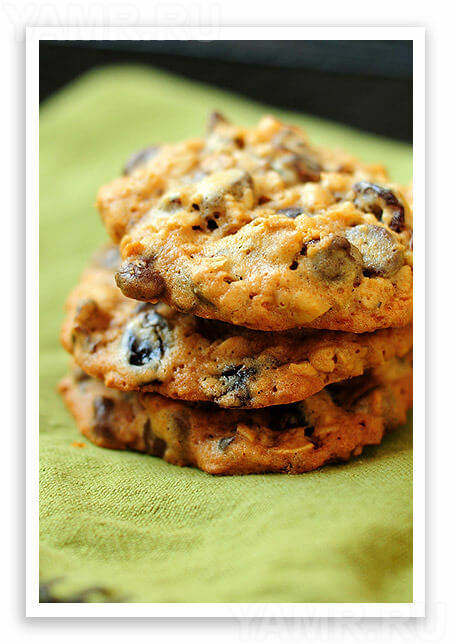 Do you have a favorite Ukrainian recipe for raisin oat cookies? If so, please let us know in the comments below or write us an e-mail.